Fixed rate loans have interest rates that do not change over time. Getting a fixed rate is a good “default” option, because you always know what your costs (and monthly payment) will be. When you borrow money, you pay for the loan by paying interest. There might be a few other fees, but interest is usually the main driver of how expensive a loan is: higher rates mean higher costs. That’s why it’s important to understand how your rate works, and if your rate can change. 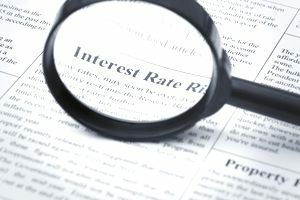 What are Fixed Interest Rates? Loans can come with variable interest rates that change over time, or fixed rates. With a fixed rate, you’ll pay the same (unchanging) interest rate over the life of your loan. This is important because the interest rate affects how much your monthly payment will be: if the rate increases, your required monthly payments could also increase – and you might not be able to afford those higher payments. What’s more, an interest rate that rises will also raise the price of whatever you bought with borrowed money. You’ll spend more on interest, but you won’t get any more of whatever you bought. To see an example of how the numbers change with a higher rate, plug some numbers into a loan amortization calculator: you’ll notice that a higher rate leads to higher monthly interest costs (and a higher payment). Interest rates change constantly as the economy grows and contracts. With a fixed rate, your loan is immune to those changes. Fixed rate loans are generally safer than loans with variable rates: you know what to expect, and you can plan for the future. There are countless stories of borrowers who suffered “payment shock” when rates on their variable rate loans went up. But you have to pay for safety – certainty does not come for free. Fixed rate loans typically start out with higher interest rates than variable rate loans. For example, the rate on a fixed rate mortgage might be one or two percent higher than the rate on an adjustable rate mortgage (ARM). That difference can make a dramatic change in your monthly payment – and it’s often tempting to go for the lower payment (with a variable rate loan). Falling rates: sometimes a fixed rate loan is the wrong choice – but you’ll rarely know it ahead of time. If interest rates fall after you get your loan (and stay lower for a long time), a variable rate loan might have been a better deal. Unfortunately, timing interest rates perfectly is extremely difficult. That said, if interest rates are at historic highs and expected to fall – and you’re getting a long term loan like a 30 year mortgage – it might make sense to at least consider a variable rate loan. Refinancing: if rates do fall and you’ve got a fixed rate loan, it’s not the end of the world. You can always try to refinance into a less expensive, lower-rate loan. However, you’ll need to qualify for the new loan, and your situation (credit scores, debt-to-income ratios, etc.) might have changed. You’ll also have to pay closing costs in many cases, and those costs will reduce any benefits you get from refinancing. Short term commitment: fixed rates can (sometimes) also be less appealing when you’ll borrow for a short amount of time. Because they automatically come with higher rates than variable rate loans, it’s worth evaluating how long you’ll keep the loan. Some variable rate loans keep the same initial rate for five years. If you expect to get rid of the loan before then, it might make sense to go for the lower (variable) rate loan. Unfortunately, life doesn’t always work out the way you planned, so you’ll need some certainty and good fortune for this strategy to pay off. How can you get a fixed rate loan? These loans are easy to find. A standard 30-year fixed rate mortgage is traditionally the most common way to buy a home. If you go to a 15-year mortgage, you might get a rate that’s competitive with an adjustable rate mortgage. Interest-only loans can also come with fixed rates (but are risky to use). Auto loans and federal student loans are often fixed rate loans: you get a monthly payment that doesn’t change, and you pay down the loan balance over time. Many personal loans also feature fixed rates, but credit cards are an important exception. With credit cards and other lines of credit, your rate can often change (sometimes not in your favor). Which Is Better: A Debt Consolidation Loan or Balance Transfer? When Can You Refinance Your Auto Loan? What Can APR Tell You About a Loan?